If the time has come to address your gutters on your home in or near Rio Rancho, New Mexico, then the company to call is ABC Seamless of Albuquerque. We’ve proudly served residents of the region since 1989, installing premium, custom-fabricated home improvement products with expert craftsmanship. Plus, we understand the unique demands of Southwestern architecture, and know that homes in the area with flat roofs need proper water-drainage equipment in place to prevent moisture damage to roofing and stucco walls. That’s why, in addition to top-quality rain gutters, we also offer other water management products to fully protect your home when storm water begins to rain down from the skies. Our durable gutters will be measured and cut with extraordinary precision right on site, using the exact measurements of your home in or near Rio Rancho, NM. This ensures a seamless gutter system that stretches flawlessly from corner to corner, minimizing the opportunity for leaks to develop. 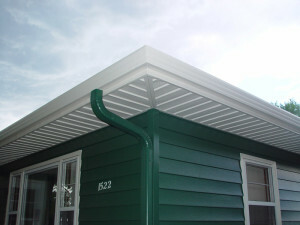 Plus, our gutter systems are 30 percent wider than traditional K-style rain gutters, enabling them to handle more rainfall effectively and efficiently, and providing the utmost in protection for your home. To learn more about our exceptional rain gutters and other products we offer to protect your home in Rio Rancho, NM, contact ABC Seamless of Albuquerque today.